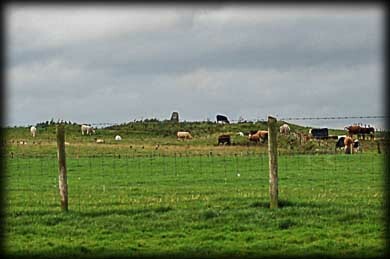 One of the many standing stones in the Rathcroghan area, Daithi's Stone - Coirthe Dearg - is a red sandstone pillar standing on a low mound surrounded by a low bank. This mound is actually a ring barrow and radiocarbon dating of charcoal found beneath the bank provided a date of 200 BCE. The stone reputedly marks the grave of Daithi the last Pagan King of Ireland (405-428 CE). He was a nephew of Niall of the Nine Hostages. After approaching the site from the west, without success, I then tried to approach from the east. Due to the amount of cattle around the mound I abandoned my attempt as I know there is often a bull in this field. We will call back. Situated: From Tulsk head north and take the first left immediately after Rathcroghan. Take the next left and drive to the end. The stone can be seen on the horizon. Over the gate. Take care. Discovery Map 33: M 8004 8272. Last visit Sept 2011.